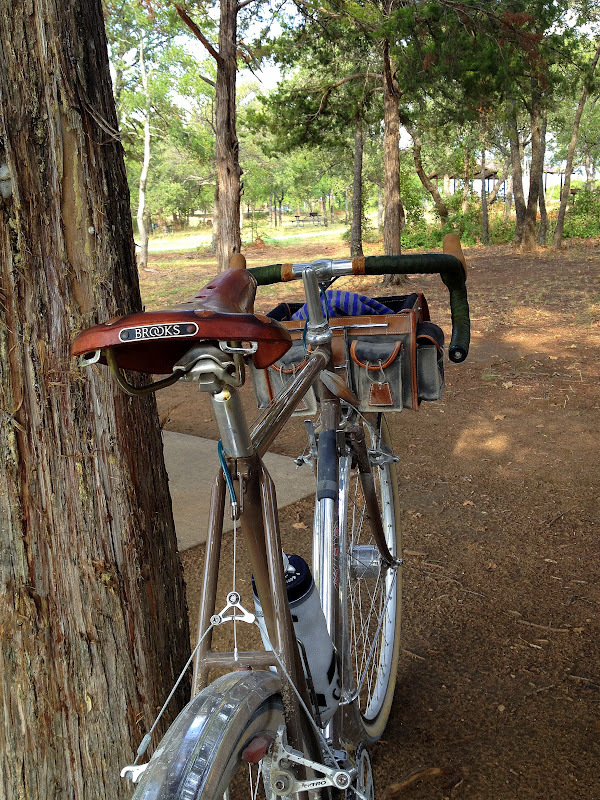 After this tranquil moment at the park, the ride became more eventful. A puncture in the middle of a long bridge, fenders filled with mud to the point of no wheels turning, and a torqued wrist during a slow speed fall when I rolled into a softer-than-anticipated shoulder. Okay, that was interesting. Can I have boring back now? Sounds like cyclocross without the snow! Ha! I've had that same sentiment. "Can I have boring back?" Classic line. I had to go back a few posts to figure out where you are. Sounds like an excellent adventure. Wrap up that wrist. Steve, it was fun until I skidded to a stop. No cowbells either.Thanks, Derrick!Rat Trap Press, photo was taken at Johnson Branch of Lake Ray Roberts State Park. Good training for bigger adventures!Hope your wrist feels better soon. Ouch! The photo then the post makes me think of the calm before the storm. Remember: Ice for the first 24 hours. Hope it doesn't slow you down too much.